Did you know that 1 in 10 Americans has a rare disorder? Did you know that means over 30 Million Americans have a condition considered "rare?!" Did you know 50% of people with a rare disease are children? The numbers are staggering. Thus, World Rare Disease Day is an annual observance held on the last day of February to raise awareness for rare diseases and improve access to treatments and medical representation for individuals with rare diseases and their families. CCA celebrates this day, too, as we regularly publish information on craniofacial syndromes, which are often very rare. The 9th Annual World Rare Disease Day will be held on Monday, February 29, 2016 (the rarest day of the year)! On this day, various activities take place in the United States, Europe, Russia, Japan and elsewhere around the world. Contact CCA and we'll provide you copies of our syndrome booklets and posters to display on your table. Make a tri-fold poster about your medical journey with photos to educate others about medical treatments and options for craniofacial reconstruction and surgery. Set up! Great places to set up are in your school lobby, library, doctor's office, or the lobby of your local hospital. Make sure you ask permission 2-3 weeks in advance and check in the week and day before the event to make sure the space is yours. Get volunteers to staff the table in shifts during the day, to have extra hands-on attention and who can talk with visitors about Rare Disorders and CCA. At your table, you can have "Feel Better" and "You're a Champ" cards for visitors to color and sign. If you collect the cards and mail them to CCA, we'll include them in the care packages we send out to CCA Kids when they have surgeries! Create ribbons out of scrap blue jeans and hand out to visitors. The blue jean ribbon is to celebrate all of our rare "genes!" They make a great awareness tool ... and they're very inexpensive if you make them out of old jeans. 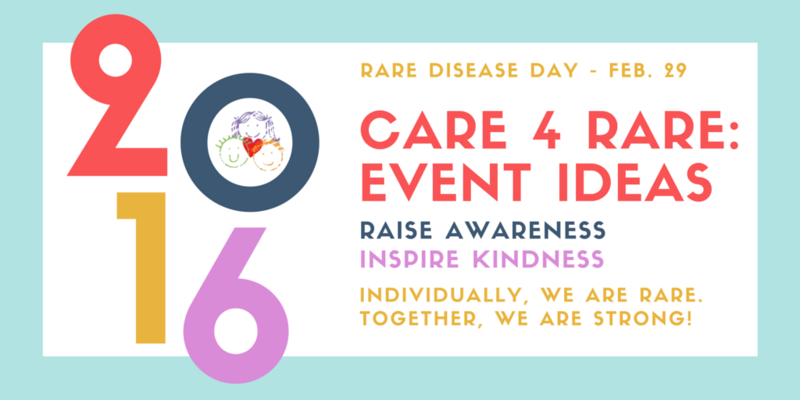 Ask your teacher or principal if you can give a short presentation on Rare Disease Day. Make it personal! Create a PowerPoint to share your story with your peers. Let them know that while you have many different medical needs, our syndromes are only a part of our lives ... not the entirety of it. CCA will provide you newsletters or brochures to hand out in the class, if you want. You can order wristbands from the office to hand out to everyone who attends as a reminder that you "Care about rare!" Schedule a Skype session with Peter Dankelson who will talk to your group what it is like to live with Goldenhar Syndrome and answer questions. Peter is an excellent speaker, so if you're not comfortable giving your own presentation, why not recruit an expert?! Lunch & Learn: Parents, ask your supervisor or HR Department if you can reserve a room for a Lunch & Learn at your place of employment. During the Lunch & Learn, your coworkers either enjoy lunch you bring in or brown bag it to hear a special presentation about the rare disorder that you are familiar with. You can also ask your surgeon or physician to present a short talk during the Lunch & Learn. Host a Jeans for Rare Genes Day at your workplace or school. For a small donation ($2-$5), employees and students can wear jeans on a Monday (Feb. 29). The money raised will help more CCA Kids travel to get specialist care for their rare syndrome. Get Crafty! If you're doing a Jeans for Rare Genes day, award a prize for the most "bedazzled" pair of jeans. Sell Jean Ribbons that you make for $1, so everyone can show their support for rare disorders. Ask permission and set up a Info & Donations table outside your favorite local business. Good ideas... salons, restaurants, baby boutiques, and coffee shops. CCA is happy to provide you with any printed material you may need to assist with your fundraiser. Just let us know! Gather all your friends and go as a group to play a round of softball, visit the zoo, or head to the movies en masse. Wear your CCA t-shirts and raise awareness that individually we may be rare, but together we are strong! Celebrate the true reason for Rare Disease Day... all of our lives are special, important, and powerful. What better way to celebrate than with those who care most about you? If you plan to do any of these ideas - or have your own - please let us know! We'd love to feature you on our blog, social media, and in our newsletters. Does a first impression need a warning? Ask the Doctor: Which Surgery First?